Now that the story that came to me on Christmas morning in 1994 is coming true -- the one that begins: "One day, Terry packed up all his important stuff and ran away" -- I suppose I should tell you just what that "important stuff" was. I'm traveling very lightly burdened because it's just a bunch of words. But they were given to me by the people I love best in this world. From Joe Strojnowski, I have a note in which he compliments me for having "a bright and crafty mind." From Ed Culhane, I have a letter of recommendation he wrote when I aspired to be the IACP coordinator for the State and Provincial Police Section. He described me as being "an extremely intelligent, creative, resourceful and energetic individual . . . extremely focused, capable of considerable and varied output . . . and an excellent problem-solver". From Bob Leu, I have a greeting card with a picture of two bears wearing Stetson hats and the message "Words cannot express what a great time we had. Thanks for all your help and friendship the past two years." 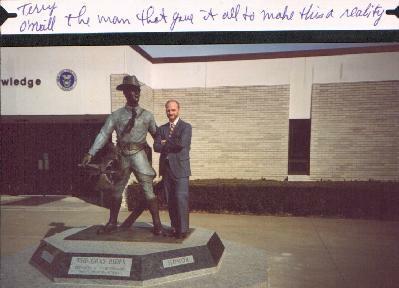 From Al Crary, I have the memory of a converstation we had after I returned from the 1993 IACP meeting in St. Louis. I told him that Tom Constantine had come into the Chiefs' hospitality room where I was entertaining our friends. He went around glad-handing everyone and as he passed me, he tugged good-naturedly at my beard. Al said: "Sounds like he's getting used to you." From Pat O'Reilly, through his wife Jackie, I got the message that "Pat always enjoyed the funny letters you sent him." From Jack Kirshberger, I have a voice mail message informing me that Pat was gone. From Morey Gavin, I have a gray polo shirt upon which is embroidered: "Former Troopers' Helping Hands." From the Association of Former New York State Troopers, I have a copy of Norman Rockwell's The Runaway on which they have written their autographs. From the Gray Rider State Trooper Monument Committee, I have the words "Honor", "Integrity", "Courage" and "Tradition" engraved on a 12,000 pound piece of granite. From Paul Richter, I have a pen certificate commemorating Governor Pataki's approval of Chapter 338 of the Laws of 1998 bearing the words: "AN ACT to amend the public health law, the public officers law and the state finance law in relation to establishing a spinal cord injury research board." From Ray Kisor, I have a letter in which he writes: "I'll just close by saying how grateful we all are -- those of us who have, do and will wear the proud, gray uniform, to you. You are a decent man and our dear friend." From George Infante, I have the word "star" with a whole new meaning. From Vince Tobia, I have the story of the Raven. From good sir Tom Constantine, I have a beautiful picture of himself on which he wrote: "To a loyal and good friend of the State Police" and a speech he gave to some college graduates that contains everything there is to know worth knowing. Oh, yes, and the most important gift of all -- a letter from him that says: "Terry, I hope my sponsorship helps rather than hinders." That's my commission and that's my true heritage. From George Fletcher Chandler, I have the "fine old tradition" that he sent out in the world newborn in 1917 and that I have now "gathered from the air" so that we may all fully appreciate "the unconquered flame." From Trooper First Class Joe O'Neill, CSP, my Dad, these words chiseled on a stone in a seaside graveyard in Surry, Maine: United States Navy, World War II. From Constable George Stephens, my great-grandfather, these words chiseled on a stone in a graveyard in Stradbally, County Waterford, Republic of Ireland: Royal Irish Constabulary. And from Billy Dooley, I have "The Parting Glass" never more sweetly sung.